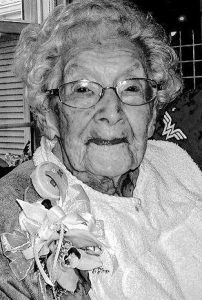 The late Hazelle Brooks did everything in her power to make sure that Mehoopany would always have a school. 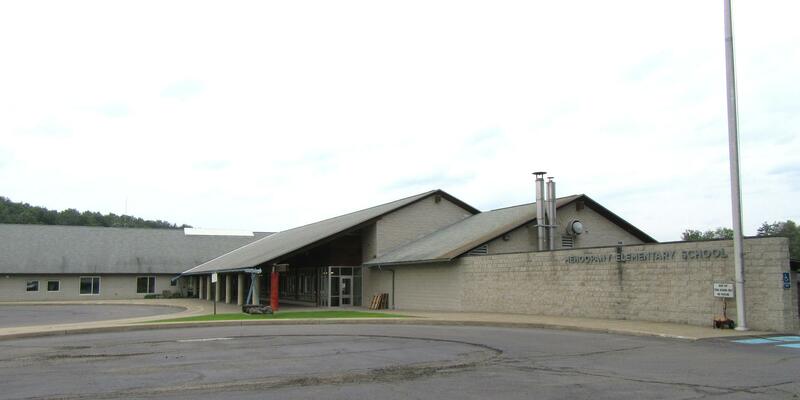 A new organization seeks to ensure that the wishes of beloved teacher and librarian (above) are honored by repurposing the Mehoopany Elementary School Building (top) after it is closed by the Tunkhannock Area School District next year. In response to the consolidation of Tunkhannock area schools over the next two years that will eventually put all public school students at buildings within the borough, a group of citizens has formed a foundation intent on setting up a charter school in the Mehoopany area. They currently have their sights on the Mehoopany Elementary School building and garnered support for their endeavor this morning from the Wyoming County Commissioners. 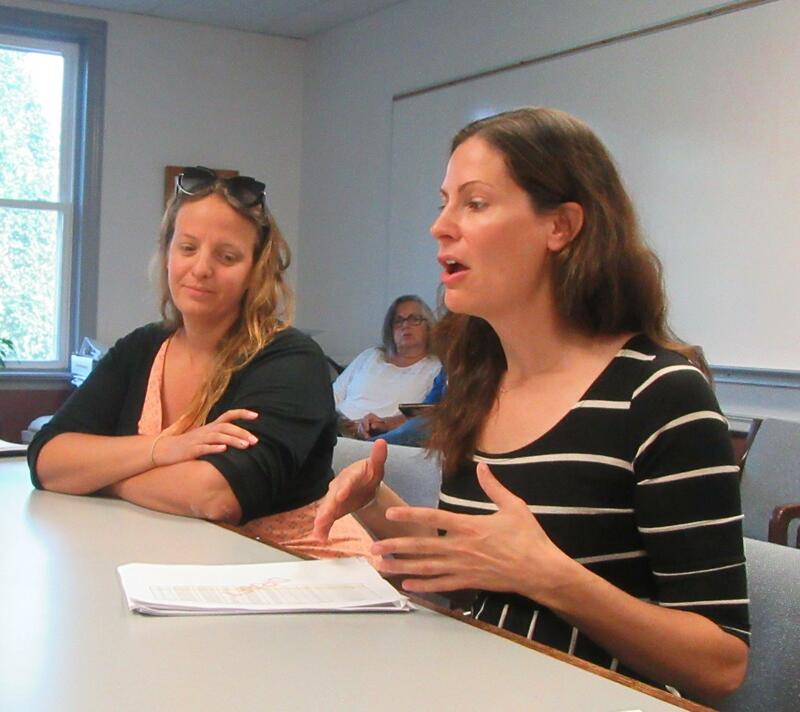 Rebecca Peterson (below, right) and Annie Shaffer (left) spoke on behalf of the Mehoopany Charter School Foundation (MCSF), citing first a 1950 agreement between Mehoopany Township and the Tunkhannock School District that there would always be a school in Mehoopany. Peterson brought a booklet co-authored by long-time Mehoopany educator Hazelle Brooks, who died at the age of 103 in 2015, that detailed an agreement that was reviewed in Harrisburg and accepted by the superintendent of Wyoming County schools. “Our contention is that this involved the state,” said Peterson, who said that it is the goal of the MCSF to build a productive relationship with the Tunkhannock Area School District. Nonetheless, she explained, the response of the school board’s solicitors is that things have changed so much in the 65 years since Mehoopany was absorbed by TASD that they are no longer bound by the agreement. According to an email sent to EndlessMtnLifestyles.com by the MCFS, the Foundation will do a short, summary presentation to introduce the Charter School at the Sept. 14 meeting of the Tunkhannock Area School Board. Time is fleeting for the school to get its charter, Shaffer noted, so the MCFS launched a social media campaign just two weeks ago to bring attention to its efforts. Pre-enrollment interest for grades K through 6 has been been strong already for the school, which would be focused on STEM (science technology engineering math) objectives. The MCFS does not need school board approval, but would still like to lease the Mehoopany school building. Commissioner Tom Henry commended Peterson and Shaffer on the efforts of MCFS, stating, “There are so many things that can be done. There are so many avenues.” Henry has already drafted a letter of support for the charter school on his own behalf in response to a letter addressed to him as chairman of the Wyoming County Commissioners. “That’s why I told them to come and present it to the board,” Henry remarked. Commissioner Judy Mead asked who could attend the school, and how it would be financially supported. “They are funded the same way that public schools are funded – from the tax dollars that are allotted,” Shaffer explained, adding that students from any school district would be eligible to attend. Tuition for students, she added, would be free. In a sense, Shaffer’s response was affirmative, but she implied that it could be worse. Currently, the amount calculated per student in the Tunkhannock Area School District is approximately $19,000. The MCSF is seeking letters of support and will also answer questions directed to mehoopanycharterschool@gmail.com. There is also information about the organization’s plans at the Mehoopany Charter School Foundation Facebook page.